Regiment: Royal Air Force Volunteer Reserve, 79 Sqdn. Country died/cemetery or memorial: United States of America, MONTGOMERY (OAKWOOD) CEMETERY ANNEXE, Sec. N. Lot 112. Grave 5. The Peachell family lived next door to the Barnes family who lost 2 sons. A former Weymouth rugby player, M Michael Peachell, son of the late DR GE Peachell and of Mrs EA Dorothy Peachell of 677 Dorchester Road, Broadwey has been killed in a flying accident caused by a freak storm in America, where he was training as a pilot. The news reached his mother a few hours after the arrival of a cheery letter from him saying how well he was getting on. Mrs Peachell said 'My son taught in a preparatory school at Sheffield for 15 months with a view to entering the Police College at Hendon'. He joined the RAF in July 1940 as a wireless operator and later was accepted for a pilot's course. He went to America in November 1941 and had passed on to the advanced stage of flying when he met his death.' He was 22. The news is naturally a great blow to his mother, whose other son is serving in the Army. Her daughter is in the WRNS signals service. 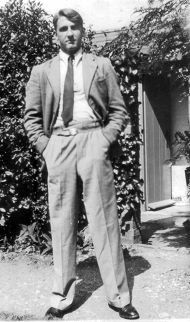 Regret, too will be felt in Weymouth rugby circles and by his former schoolfellows at Weymouth College, where he was educated from 1933 to 1938. He had a distinguished record at the school, especially in the sports sphere. He was secretary of the games committee and repreented 'A' House in football, cricket, fives, athletics, tennis and dramatics. He was captain of the house cricket and fives teams. He played rugby for the College, Weymouth, West Dorset and at one time for HMS Osprey. Mr Peachell had thought of taking up journalism as a profession. He was an editor of Weymouth College journal 'The Clavinian'. Country died/cemetery or memorial: United Kingdom, PORTSMOUTH NAVAL MEMORIAL, Panel 55, Column 2. Born on 28 March 1919 in Dorchester, the son of Albert Owen Randall and Edith Randall, of Upwey. http://hmshood.com/crew/memorial/index.htm - Crew Lost During the Sinking of Hood, 24th May 1941 Contained on this website are 1,415 individual memorial pages - one for each man confirmed lost when Hood sank during combat with the German battleship Bismarck in the Denmark Strait on 24th May 1941. These deaths constituted the Royal Navy's greatest single ship loss of the Second World War. Their sacrifices were not in vain: Though they were lost, the action in the Denmark Strait did end Bismarck's sortie. Through their deaths, the resolve of the British Empire was restored with a vengeance. They served as tragic reminders as to why the war was being fought and why it had to be won. Regiment: Coldstream Guards, 3rd Bn. Country died/cemetery or memorial: Egypt, ALAMEIN MEMORIAL, Column 54. SON OF ELLEN STEELE, OF BINCOMBE, DORSETSHIRE. Regiment: Coldstream Guards, 5th Bn. Country died/cemetery or memorial: Netherlands, JONKERBOS WAR CEMETERY, 22. C. 3. Nijmegen was a front line town from 17 September 1944 until February 1945. The cemetery, which was created by No. 3 Casualty Clearing station, is in a wooded area known as Jonkers Bosch, from which it took its name. SON OF THOMAS STEELE, AND OF ELLEN STEELE, OF BINCOMBE, DORSETSHIRE. Husband of Florence Mary West,of Basingstoke, Hampshire. B.A., Ph.D. The Home Guard was operational from 1940 to 1944, and was set up by the British Army during the Second World War. The nickname "Dad's Army" was due to the average age of the local volunteers who signed up for The Home Guard, who were ineligible for military service, usually because of their age. Originally called "Local Defence Volunteers" or LDV, the Home Guard's role was to defend British coastal areas, airfields, factories and explosives stores in the case of invasion by German forces and their allies. During a combined Army and RAF exercise near Imber on Monday an unfortunate accident occurred which resulted in 19 men dead. It is understood that 30 more are still in a serious condition. The incident occurred during a realistic manoeuvre in which fighter aircraft were practising power-diving (aircraft dive on to their target with all their machine guns blazing). During the demonstration a number of spectators were seen suddenly to fall to the ground. Doctors and nurses were immediately rushed to the spot but it was found that a number of officers and soldiers were beyond aid. 5 Hurricanes fired at dummy troops - a 6th fired at the spectators' enclosure in mistake for the target. Two officers of the Dorset Home Guard, Captain JR West of Upwey (Education Officer for Dorset) and Captain FJ Willy of Poole were among those killed in the accident in Monday's RAF Army demonstration near Warminster. Captain Lewis Jones of Weymouth, another Home Guard officer is in Shaftesbury Hospital suffering from an injury to a leg and shock received in the incident. Captain Blackstock of Holcomb Cottage, Upwey was present at the demonstration and escaped injury. Education in Dorset has sustained a severe loss by the tragic death of Dr West. An extremely able administrator, Dr West took up is appointment in May 1936 and he had the happiest relations not only with his colleagues on the county authority but with the teaching profession, whose members held him in warm regard and recognised his outstanding qualities as an educationalist. The outbreak of the war interrupted an important scheme of school re-organisation in which he was closely concerned. This scheme involved amalgamations and the building of new schools, both in towns and villages and parts of it were in operation when hostilities commenced. Latterly Dr West undertook fresh responsibilities in connection with the Youth Movement. Dr West began his career as an educational administrator on the staff of Reading Education Office, but left soon after the outbreak of the Great War and joined the Army. He attained the rank of Captain in the Royal Berkshire Regiment. He saw service in Gallipoli, North West Egypt, Salonika and France. He was twice wounded and was awarded the MC. After the war he completed his degree course at Reading and in 1921 obtained his BA at London University wth a first class honours degree in history. He also held a degree of PhD London and ws a Fellow of the Royal Historical Society. He was a member of the Royal Society of Teachers. In 1927 he was appointed junior assistant to the Director of Education Nottinghamshire and in 1933 Deputy Director of Education for Staffordshire. He was appointed County Education Officer for Dorset in 1936 succeeding Mr Clement G Bone. Outside Education Dr West had many interests. He was a member of Came Golf Club and Weymouth Drama Club.